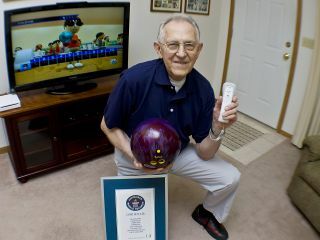 Disheartened Wii gamers, this one's for you: having only received a copy of Wii Sports in April 2009, 85-year-old John Bates has gone on to achieve the Guinness World Record for Most Perfect Games on Wii Bowling. Yes, such a thing does exist, and if you can beat his run of 2,850 perfect games then you could steal the title out from under him. Presumably all it takes is a solid year's worth of practice, so there's hope for us all. The launch of the Guinness World Records 2011 Gamers Edition has revealed other game-related records. These include the Largest Collection of Super Mario Memorabilia (5,400 individual items), and Longest Marathon Playing a Dance Game, a title held by a Brit, Chris McGivern, who danced for 13 hours, 33 minutes and 56 seconds straight. As well as the record breakers, Guinness has revealed the results of a survey to find the best videogame character of all time. Rather predictably, it's-a me, Mario, with Zelda's stoic Link in second place. More than 13,000 gaming fans voted, with eleven of the top 50 characters coming from Nintendo's hallowed halls. Poor old Sonic only managed 10th place.